Nigel Irens is perhaps best known for his globe circling fast multi-hulls but, when he decided to build a boat for his own use in 1994, his inspiration came from a Shetland Island fishing boat that he had once owned. This inspiration was melded with state of the art design techniques and materials to produce a unique design. 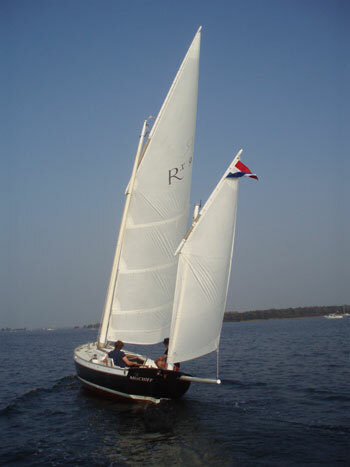 Roxane is a traditional looking hi-tech fast cruising yacht. She is a yawl rigged lugger with a loose footed main sail and unstayed carbon and epoxy fibre masts and spars. The boat Nigel built for himself aroused much interest and became the prototype for the boat which quickly went into production. 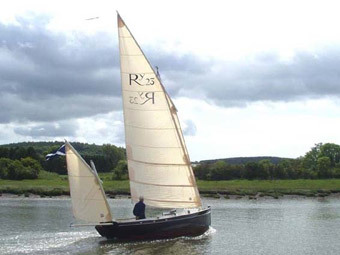 Bill Stanton was inspired by Roxanne but wanted a smaller day sailer for estuary and coastal sailing around Devon and Cornwall. Bill is a very experienced sailor who had supported the Roxane project and was able to persuade Nigel to design a smaller version. Romilly was the result. Since Romilly would be used primarily as a day boat with occasional overnight stop overs it was decided to make cockpit size a priority as a result the cockpit provides ample room. The cabin is really a cuddy which is adequate for 2 sleeping on cushions on the floor. There is no built in provision for cooking in the original boats although some builders of the strip pine version have taken the decision to make the cabin somewhat bigger and have therefore been able to fit in more facilities. Romilly has a high ballast ratio, the GRP version uses the same cast iron centre board as Roxanne and the SPV uses a cast lead ballast plug and a steel centre plate to provide a similar ballast ratio. She has a very fine hull form relatively large sail area making for a fast vessel. The original version has a loose footed main on a carbon fibre mast, some builders of the SPV have used the alternative sail plan which includes a boom. Although calculations are provided for wooden spars most builders stick with the original concept and use carbon fibre. This entry was posted on Jan 24, 08:49 pm by Phil Holden. You can skip to the end and leave a response using the comment form.